Think about your worst nightmare as a resort owner. Fire, hurricane, bug and rodent infestation, or maybe worse, negative customer reviews. One high-end resort experienced two of those. The issues were discovered when multiple travel sites began to report stories of rodents and snakes checking in unannounced with their paying guests, the management team at this luxurious resort in Punta Cana, DR knew they needed to take swift action. When originally built, this beautiful beachside resort installed natural palm roofing throughout the resort, like many hotels, zoos, and aquariums, often do. 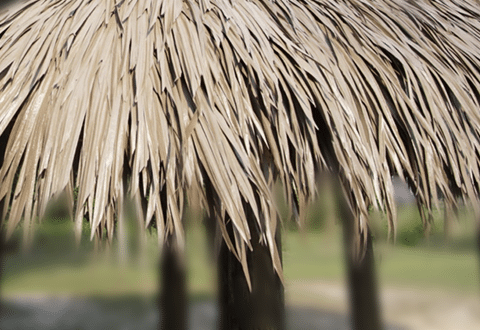 When new, natural palm roofing is undeniably attractive, and delivers a tropical aesthetic second to none. But in a short time, natural materials decay, and succumb to daily wind, rain and UV exposure. Inevitably, they become expensive to repair and maintain, and decayed material causes other maintenance problems; pools get clogged, furniture gets dirty and guest’s food gets contaminated! On top of all these frustrations–natural materials make great nesting places for all sorts of creatures. As the resort management team began investigating the claims of rodents and snakes in guest rooms. They discovered the infestation and animal access was happening through their once beautiful natural palm roofing. Shortly after this discovery, the team was presented with Endureed’s VIVA synthetic thatch roofing materials, and instantly, they knew they’d found the perfect solution. In addition to being rodent, wind, fire and UV resistant, it would also perfectly mimic the look and feel of natural material, and preserve the tropical spirit of the resort! Finally, the daily pool skimming, snakes in the ceilings, constant repairs, and fire risk fears could be put to rest, leaving more time for doing what they really love doing – taking care of their guests! We’d love to help you put your best foot forward with your clients! Contact us today for a FREE quote or consultation!